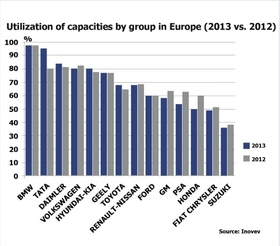 BMW, Tata Motors' Jaguar Land Rover and Daimler ranked one, two and three in European plant capacity usage last year, according to data from research firm Inovev. All three automakers turned that efficiency into profitability. BMW's factories in Europe ran at nearly 100 percent capacity last year, the data shows. The automaker's global production network actually is producing at 120 percent capacity because of overtime, weekend work and extra shifts, a BMW executive told Automotive News Europe on condition of anonymity because the company doesn't discuss the topic publicly. BMW reported a pre-tax profit of 7.9 billion euros and a net profit of 5.3 billion euros for 2013, both were records. BMW’s automotive EBIT margin was 9.4 percent. Daimler’s factories are busy because of the success of its compacts, which are made in Hungary, Germany and at contract manufacturer Valmet’s factory in Finland. Daimler’s 2013 EBIT was 4 billion euros despite heavy investments in its compacts.